February Midweek Socials Hawaiian Style - Chat, Drink and Hula! You must be a member of the London Midweek Socials Group to attend this activity. Would you like to join this group? 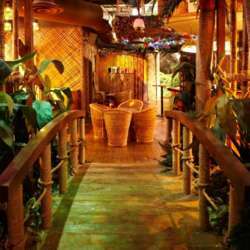 Let's escape from the gloomy winter weather and socialise at this Tiki-inspired bar in the heart of London with beaches and treetops! Protected content offers a rainforest styled retreat with giant palm trees, tropical leaf patterned walls, and rustic wooden planking. The Club Room has been reserved exclusively for InterNations. FREE hot finger food will be provided at 8pm. We will be joined by our friends from the InterNations London Savoir Vivre group!